Kindness and Forgiveness are Better Than Charity…. I read this verse today and I felt compelled to share it with you. It’s a small example of the way Islam cultivates the individual. We are told that it is better to speak kind words and to forgive others than it is to “help” them with charity, financial or otherwise, if we are then going to follow it up with reminders of our “favor”, or otherwise harm the person we supposedly “helped”. Do you know of anyone who has helped someone out, then after that, never let them forget it? We as Muslims must be genuine in our actions and we do good, for God’s sake alone. So if we are to help anyone, it should be for the pleasure of God, knowing that He never allows the reward for good to be lost, nor does He allow our sincere deeds go to waste. In that case, we would never expect even appreciation from those we help, but only appreciation from God Himself. And He has told us here that He is free of need, and lenient and patient. Indicating that it is ridiculous to think He needs us to do acts of charity, rather we do them for the good of our own souls. This is selfish selflessness. We are doing good, treating others well, spreading kindness and charity with the hope that our Maker will be pleased with us. That’s what I call a win win situation. If you read the Quran you will find all kinds of beautiful instructions, the intricacy of which are astounding. Our character is cultivated through these injunctions, especially when coupled with the stories and examples of the prophets present within its pages. 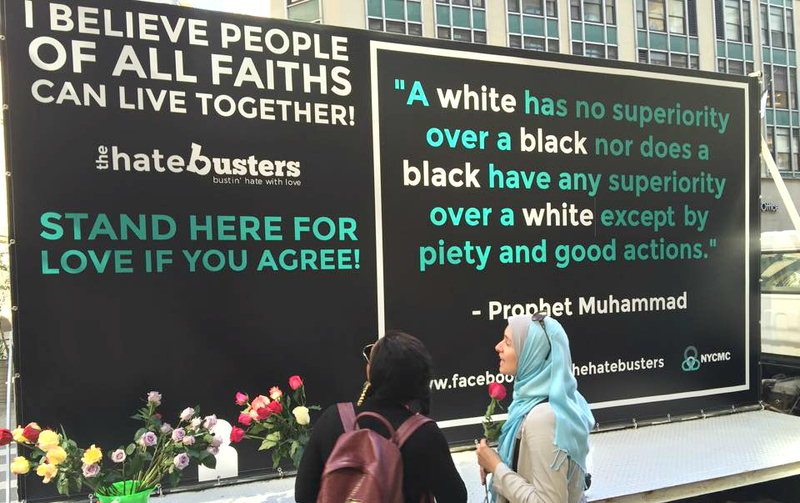 I recently had the pleasure of joining The Hate Busters in NYC, a new initiative designed to counter negativity and media misrepresentation, by spreading the loving message of Islam, directly from the sources. On Broadway in midtown Manhattan, the response on the street was amazing, with many stopping by and expressing their happiness and agreement with both the message and our mission. It was great engaging with so many people, seeing their bright smiles and hearing their touching and powerful words of support. One woman asked if she could hug me. Her tight embrace wordlessly conveyed solidarity and gratitude. The most beautiful part of the day for me though, was when we took a break and went to the mosque a few blocks away, for the afternoon prayer. I joined other women who were there to pray as well. We stood jointly – foot to foot, shoulder to shoulder, and we performed the prayer as one unit – as sisters. 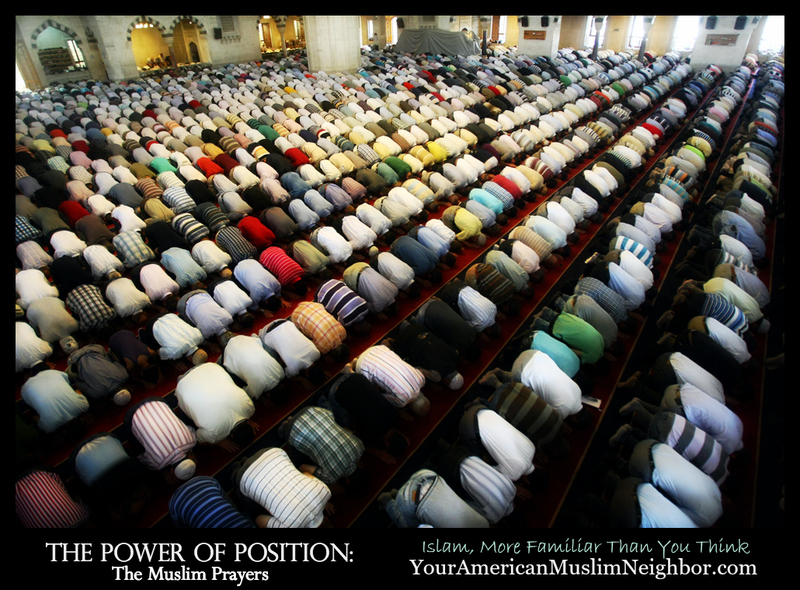 Within our prayer was the manifestation of the statement of the Prophet Muhammad we had been sharing with the public. The very fruit of the teachings of Islam. I saw the beauty of the varying hues of our hands, side by side on the carpet as we lowered our heads down to the floor before our Maker, the One who is truly superior to all; Who created us as equals, and made us vary so that we may know one another. The richness of our diversity only enhanced our connection to one another and increased our devotion to the One, who through His supreme knowledge and wisdom gave us our unique characteristics. After we completed the prayer, we greeted each other with wide smiles and loving handshakes. This is a gift to us from our Creator, to be able to see the beauty and goodness in each other. To feel genuine love for people we’ve never met. Women, whose hearts, like mine, desire the pleasure of our Lord, and soften with gratitude, humility and love of Him. Islam broadened my horizons and enriched my life in so many ways. 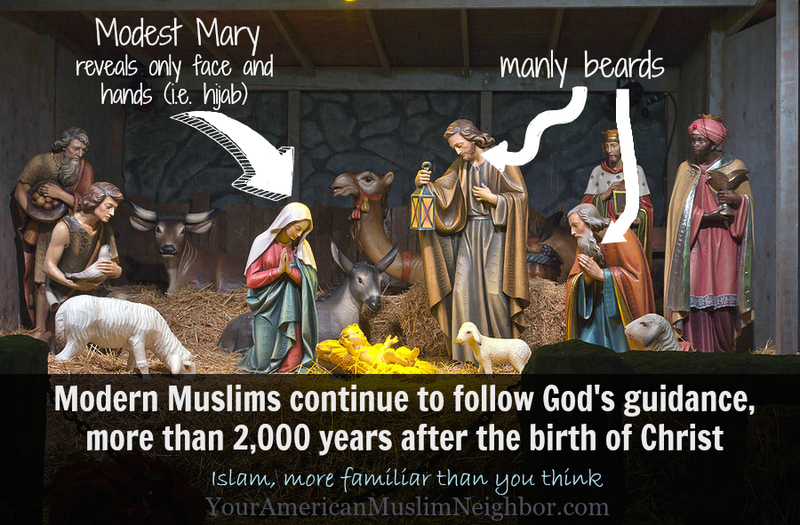 The pleasure of being part of such a diverse group is something I had never experienced prior to my Islam. I consider this expansion to be one of the many blessings I have since received. It’s amazing that 1400 years ago, the cure for racism was implemented amongst the Muslims and that it can be eradicated from anyone who truly loves God and chooses to submit themselves to Him today, by the same means. I hope the fact that these words were uttered by the prophet Muhammad makes many people think about him and see what a loving, equitable human being he truly was and the value Islam has brought to humanity.